What will my purchase include? 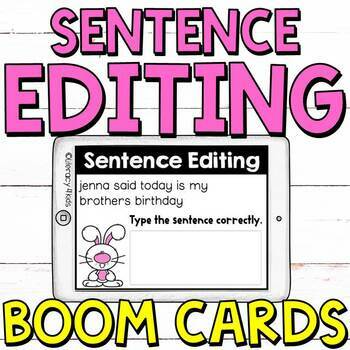 With this purchase, you'll get a deck of 20 Boom Cards (Digital Task Cards) that require your students to correctly type sentences. Each sentence must be correct (spacing, capitalization, spelling, punctuation) before advancing to the next card. 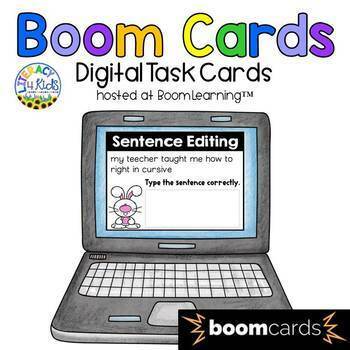 In addition, these cards help strengthen your students' typing skills and are hosted at Boom Learning™. Can I preview a few of these Boom Cards before I buy them? Of course! CLICK HERE to try a FREE preview. 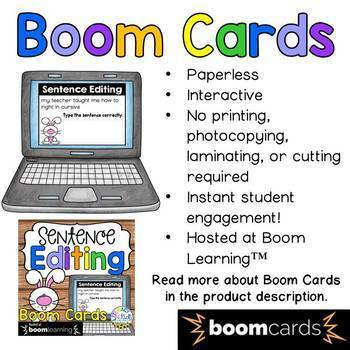 Why do teachers (and students) LOVE Boom Cards? because they are . . .
♥Completely engaging and just plain FUN! "With your Teachers Pay Teachers purchase, users new to Boom Learning™ get a three-month free trial of student progress reporting for up to 150 students. Your trial includes the ability to make up to 5 free DIY decks. You may upgrade or cancel at any time. Boom Cards play on modern browsers (released in the last three years) on interactive whiteboards, computers and tablets. Boom Cards apps are also available. Not sure if your browser is modern enough? Try a free Boom Cards deck first. When you redeem your purchase, Boom Learning™ opens an account for you if you do not already have one. If you do not subscribe at the end of your 3 month free trial, you will still be able to continue using Boom Cards with the Fast Play feature. Fast Play does not track individual progress. If you do not subscribe we will delete your student records 3 months after the expiration of the trial to protect student privacy." What happens when my free trial with Boom Learning™ comes to an end? When your free trial comes to an end, you can continue to track student progress by purchasing an annual subscription to Boom Learning. If you do not subscribe at the end of your free trial, you will still be able to continue using Boom Cards with the Fast Play feature. Fast Play does not track individual progress. If you do not subscribe, we will delete your student records 3 months after the expiration of the trial to protect student privacy.